Somewhere along the Caribbean coast, nearby the borders of Nicaragua is a small Colombian island that truly is the definition of untouched paradise. A place where tourists are the minority and the ‘island lifestyle’ is infectious. 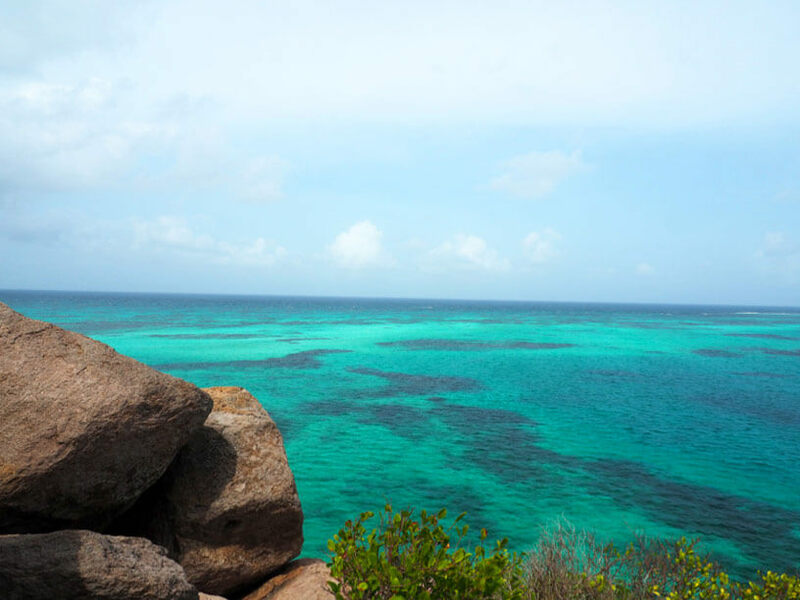 It’s home to the second largest reef in the world and was once the landing base for the infamous pirate Captain Morgan. 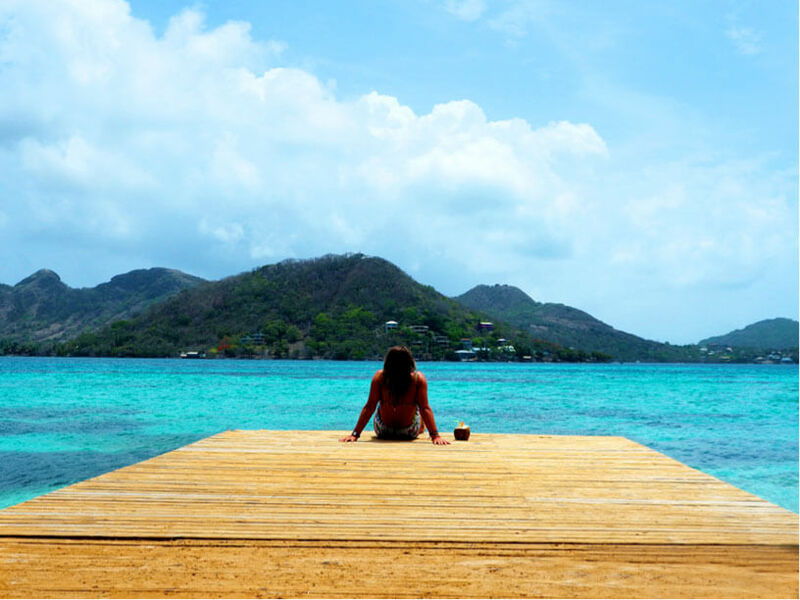 Ladies and gentlemen, let me introduce Colombia’s best-kept secret – Providencia. During my travels through Colombia I’d heard the name Providencia tossed around only a few times. It’s more popular neighbour; the San Andres Island was supposedly the place to go. 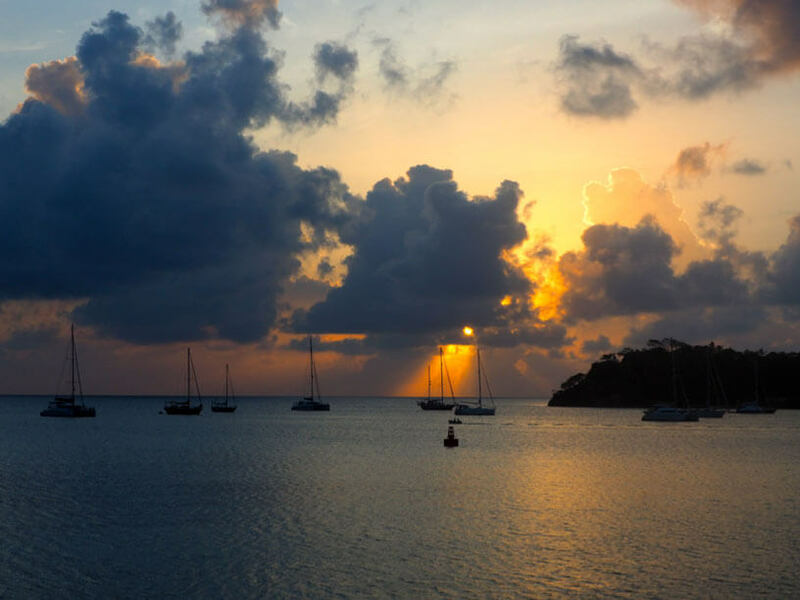 However the thought of sharing the Caribbean coast with thousands of other tourists on an island that was essentially a floating duty-free shopping plaza didn’t sound so appealing to my two travel buddies and I caught the catamaran to Providencia to find paradise. Before we begin there is the disclaimer to finding the aforementioned paradise. It takes a very rough 3 to 8 hour boat ride to get there. Depending on the weather you could either have a lovely sail or a ride in something similar to a dishwasher. We stepped on the catamaran at the dock in Providencia after a turbulent 3.5-hour journey a little shaky and seeing green. It wasn’t quite the idyllic start we’d been hoping for however once we had a good look around, the queasiness faded quickly. A tall girl with skin the colour of coffee with long braids down her back approached us with a wide smile. Her throaty voice was lilted with the Creole accent that most locals on the island spoke. She pointed to a faded blue station wagon with a young man leaning against it. In the limited information we read about Providencia we knew this – about AUD$11 - was the standard taxi fare for the island, so we climbed into the prehistoric vehicle and set off. Our accommodation was in Freshwater Bay at the Blue Almond Hostel, which is the only backpacker hostel on the island. There were several other small hotels and haciendas around the island, all owned by local people. One unique quality about Providencia is that only people from the island can have businesses, which means no giant hotelier can come in and take over this little slice of heaven. We spent our first afternoon exploring the area of Freshwater Bay and lolling around in the clear blue water. At sunset we watched the sky transform from blue to yellow to black as we devoured a fresh seafood dinner. Our second day was spent at Crab Cay, a tiny speck of an island just a few hundred metres off the shores of Providencia. We rented kayaks and paddled from the mainland across the azure coloured waters, jumping out halfway through for a quick snorkel of the world below. We reached the island and were greeted by two park rangers, Christian and Roger - the only inhabitants on the small cay. “I feel like we’re on Survivor” my pal Lucy said, as we drank from the coconuts Roger cut open for us, whilst dodging the many crabs that scuttled around. Christian explained to us that the Black Land crabs come here around this time every year from the mainland to lay their eggs. 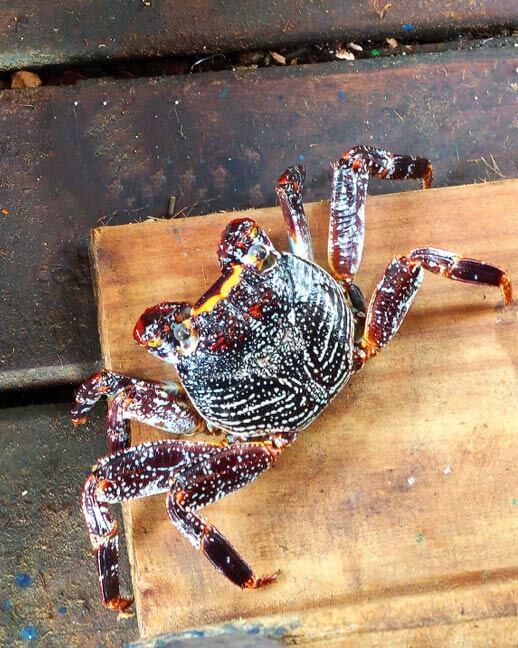 The crabs were famous for descending from the mountains en masse towards the water creating roadblocks and traffic jams but the locals celebrated their journey, making the small crustaceans almost sacred. We jumped off the small dock and snorkelled amongst schools of fish that flitted around the healthy coral. Several turtles swam by, as well as a lone stingray. I couldn’t help dropping a ‘Finding Nemo’ reference into every sentence I uttered. As a long time fan of the movie, this underwater world was absolute quoting heaven. I left the water to walk up to the highest point of the island, where a large rock served as a lookout point. The reef below me shimmered in different shades of blue, and the view went for miles. I was jealous of the birds that circled around the cay; they got to witness this view every day. The sun started to set, and we had to head back to the mainland. Tired, sunburnt and snorkelled out we were reluctant to paddle back on the kayaks. It seemed there was a light at the end of the tunnel, in the shade of deep blue. As the islands only resort, Deep Blue Hotel was the luxury way to stay on Providencia. While we couldn’t afford the pricey accommodation, their fancy restaurant would scrape into our budget. We dropped off our kayaks and made a beeline to the ocean side tables to watch the rest of the sunset. As the black crabs darted around our feet, we devoured the fresh catch of the day and washed it down with coconut lemonade – quite possibly the best drink I’ve ever tasted. 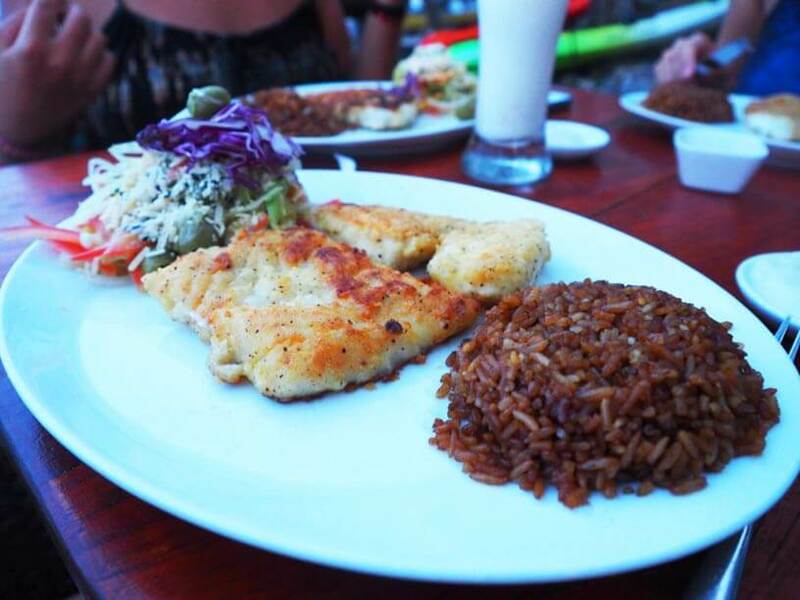 Dinner at Deep Blue Restaurant - freshly caught that day! The following two days we rented a ‘mule’ - a golf cart on steroids - that was the main form of transport on the island and spent our time buzzing around the island. 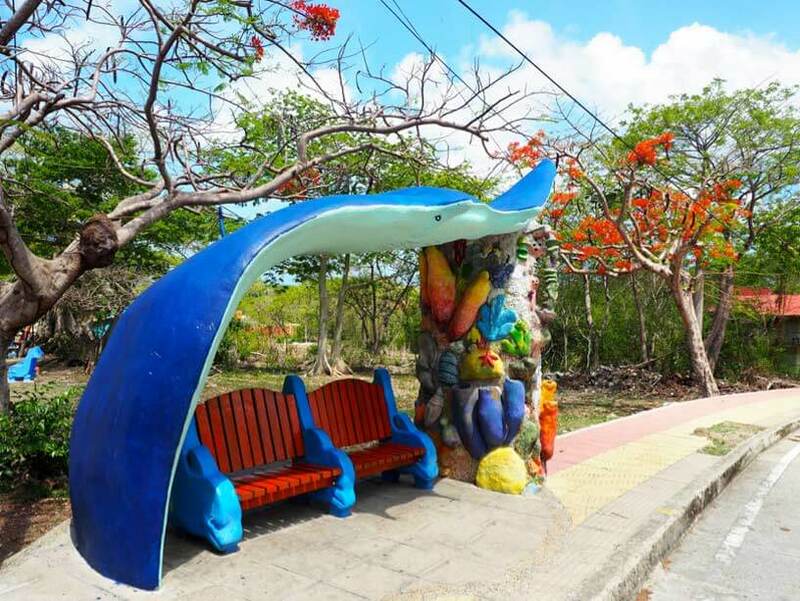 Our attention was drawn to the under-the-sea themed bus stops and amazing viewpoints. We pulled in at Almond Bay where a large octopus shaped bus stop stood and walked down the hilly path to the beach. Here some Rastafarian locals greeted us warmly with freshly cut coconuts and showed us how to make rondon, the islands famous dish. We explored every bay and swimming hole and made plans to hike to the highest point of the island – however the heat of the Caribbean sun lured us to the beach instead of the mountains and we promised to hike it when we return one day. Our last day on the island, the girls and I separated for the morning. I was off to scuba dive in the second largest reef in the world and the girls were going to Santa Catalina – the small island close enough to Providencia that it can be accessed by foot over a long, brightly painted bridge. They were planning to find Morgan’s Head, the rocky formation named after the infamous pirate Henry Morgan who used the island as a base for raiding the Spanish colonies in the 1600s. There are rumours that there are still undiscovered treasures in Providencia, which the locals will proudly drop into every conversation you have. I, on the other hand, was about to witness what treasures Providencia had below the water. As one of the best (and cheapest) places to dive in the world, I couldn’t pass up this opportunity. What I didn’t realise was that the ‘treasures’ Providencia had to offer were in the form of huge fish – sharks to be exact! I will admit, these were only Caribbean reef sharks, but as an ocean dwelling Australian, the word ‘shark’ still sends a chill down my spine. Fortunately, once we descended into the deep blue waters, my fear faded away as the school of almost doglike sharks swam around us. 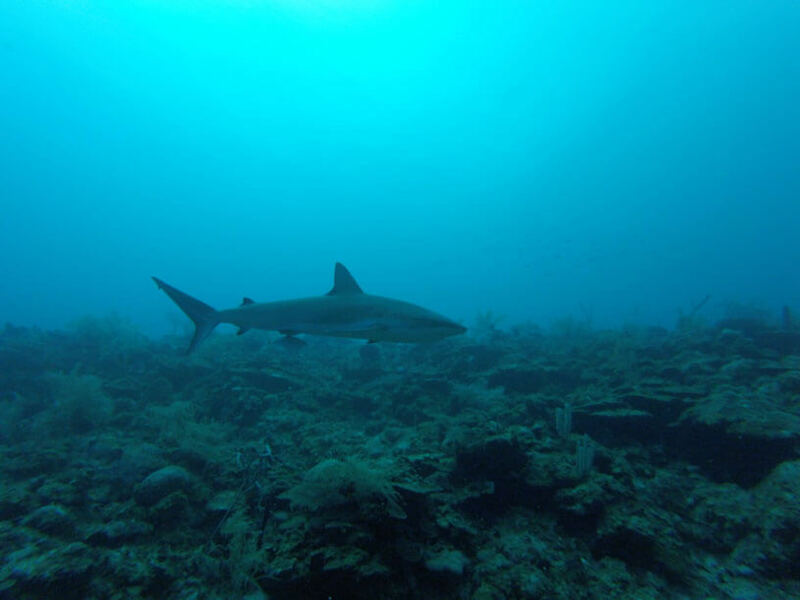 My dreadlocked divemaster pointed out different fish and coral but my attention was drawn to the sharks, the way they glided through the water was mesmerising. After two dives we headed back to the mainland, where I met up with my two friends and we floated in the shallow waters, exchanging stories of our morning adventures and basking in the last moments of the Providencia sun. We caught a ride in the back of a truck to the main dock and chowed down on freshly cook fruit bread while we waited for the catamaran. It had been such a brilliant week in the little piece of paradise and I knew I wanted to return. Providencia is definitely the hidden treasure of Colombia and I hope it has the same fate as the treasures that Captain Morgan once hid on the island and will never be discovered by the rest of the public.